^ Chris, Tucker (15 March 2007). "Optimal Package Install/Uninstall Manager" (PDF). UC San Diego: 1. Retrieved 14 September 2011. ^ "Linux repository classification schemes". braintickle.blogspot.com. Retrieved 1 March 2008. ^ "CentOS yum pinning rpms". centos.org. Archived from the original on 2 November 2007. Retrieved 1 March 2008. ^ a b "pacman(8) Manual Page". archlinux.org. Retrieved 1 March 2008. 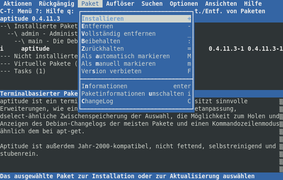 ^ "How to keep specific versions of packages installed (complex)". debian.org. Retrieved 1 March 2008. ^ "Apt pinning to blacklist a package". Retrieved 19 August 2010. ^ "Pacman/Rosetta - ArchWiki". wiki.archlinux.org. Retrieved 17 September 2017.